We use chicken domes, chicken tractors, or as in Australia we call chickens chooks, so our dome is called a ‘Chook Dome’. We haven’t found it necessary to change to a geodesic dome, because our domes are sturdy and durable and have lasted well. A geodesic dome seems a whole lot of mind numbing effort, and I’ve seen a couple where it is too high in the centre to be moved by one person standing inside. One of our domes has been in service for ten years, we refurbished the netting and revamped the door after Cyclone Yasi in 2011 gave it a bashing, but I gotta say that our dome has stood the test of the world’s 2nd biggest storm in history, so we reckon we built it right! We built a second dome to the same design a couple of years ago in Dec 2013. 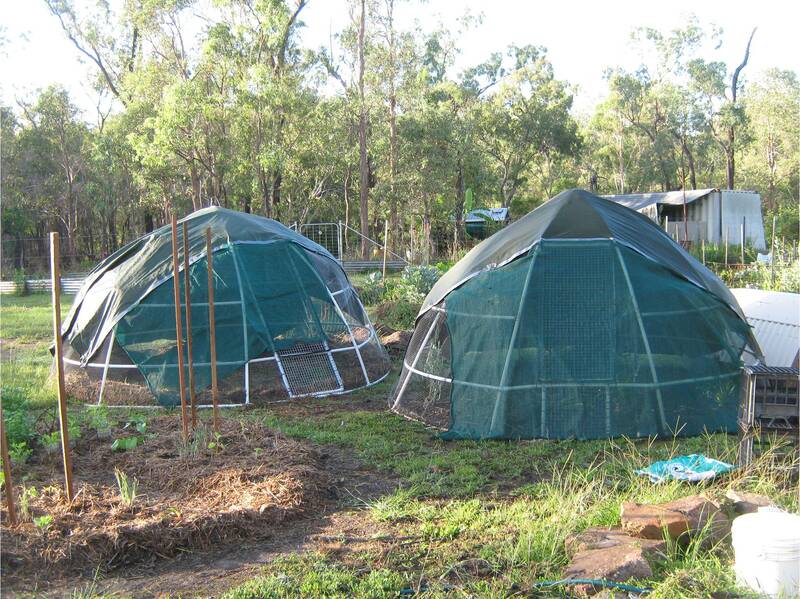 Both domes work extremely well, they need little or no maintenance and the chooks are very contented. The internet is littered with failures and examples of how not to build a dome. Do not use black poly pipe. Do not use grey electrical conduit. They are not as good as PVC and don’t last. For our design you need white PVC pressure pipe, 20mm (3/4 inch). It’s very cheap and light, comes in 6 metre lengths, and it bends easily without collapsing. The DMK page link below, shows you exactly how we did it step by step, with pics of each step and a detailed sketch, and even printable instructions if desired. Categories: Cages & Tractors, Chooks, Domes, Handy Hints & Good Ideas | Tags: chicken dome, chicken tractor, chook dome, chook tractor, Linda Woodrow chook dome, mandala garden, permaculture garden | Permalink.